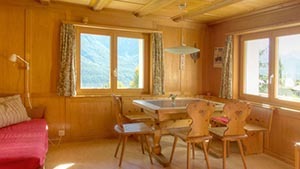 Chasa Spadla cottage lies in an absolutely quiet and magnificent situation just above the village of Sent in the Engadine valley, three minutes from the next bus stop and five minutes from the village center. Although the cottage is not big, it offers plenty of space, ideal for families up to 7 people. Built in 1969 it was redeveloped in 2013 and 2014. A balcony, a terrace and the meadow in front of the the house invite to enjoy the panoramic view and the sun. The house is surrounded by meadows and farms. 50 m below the house is the playground of the Sent primary school, a generous playground for your children. 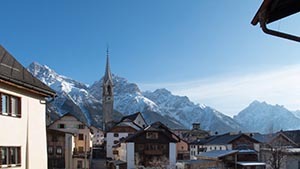 Sent is a charming village on a sunny terrace above Scuol (Schuls) in Engadine Scuol Samnaun Val Müstair region. Although not a big village, it offers several shops for the daily needs and a few restaurants. The friendly and cosmopolitan inhabitants of Sent speak the melodic Vallader (Romance of the Lower Engadine), German and many of them a fairly good English. Sent is not far from the Swiss national park and is a perfect starting point for a huge number of interesting excursions and mountain hikes on foot or mountain bike. In winter, Sent is the finishing point of the “dream ski slope” of the skiing area Scuol Motta Naluns and, nevertheless, is off the slopes bustle. On your snowshoes or on cross-country skis you can discover an intact, quiet winter scenery. And yes: „Bainvgnü‟ means „welcome‟!